Looking for vintage-inspired rings? Check out these dazzling diamond bridal sets from Anjolee. A stunning round center diamond is set with a four prong design and surrounded by a double row of round diamonds in this vintage-inspired design. 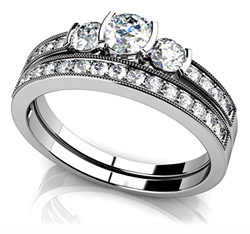 This is one of my favorite wedding ring sets! This vintage-look engagement ring has a three stone design with side stones. 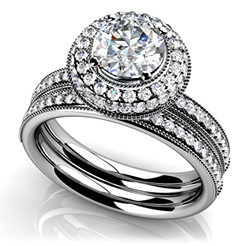 A half bezel setting complements the beauty of the three round diamonds. 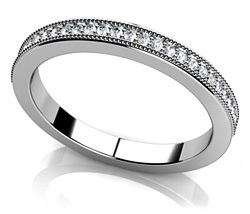 If you are looking for wedding sets with diamonds and added gemstones, check out this fabulous eternity ring. 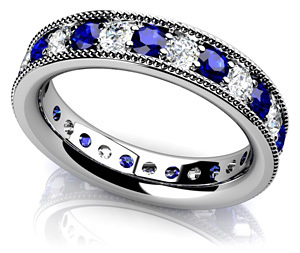 You can customize the ring using the gemstones of your choice. I love the delicate look of this vintage inspired diamond wedding band. Anjolee.com lets you custom build each of their wedding rings to suit your style and budget. Anjolee is the manufacturer of all jewelry items on the website. The website also offers an extensive collection of diamond tennis bracelets, gemstone bracelets, diamond earrings, diamond necklaces and diamond pendants. Vintage Wedding Buntings Now Available!